The bear opened its big mouth and growled at Donovan: "Grrrrrrrrrrrrr!" Donovan said, "Time to go, time to go!" He tiptoed away: TIP, TIP, TIP, TIP, TIP. And the bear went TIP, TIP, TIP, TIP, TIP after him. "Aaaaaaahhhhhh!" yelled Donovan, and he started to walk: PAT, PAT, PAT, PAT, PAT. And the bear went PAT, PAT, PAT, PAT, PAT after him. Makwa kì mangì pàkidònene ashidj onìkimotawàn Donovanan: "Grrrrrrrrrrrr!" Donovan ikido, "Nimàdjà, nimàdjà!" Kì kàgìmòdàmì kì màdjì: TIP, TIP, TIP, TIP, TIP. Kaye wìn makwa kì: TIP, TIP, TIP, TIP, TIP onòsinewàn. "Aaaaaaahhhhhh!" nòndàgoze Donovan, kì màdjìkishin. PAT, PAT, PAT, PAT, PAT. Kaye wìn makwa kì: PAT, PAT, PAT, PAT, PAT onòsinewàn. Many of us have returned to Robert Munsch's much-loved stories throughout the years. Librarians, teachers, parents and caregivers love them because they lend themselves to being read loud (again and again!). Onomatopoeia, fun follow-along repetition, larger-than-life antics, memorable characters - it's all there in his classics. Unfortunately, though Bear for Breakfast attempts to revive that formula, it misses the mark. Notably, this edition is dual language (English with an Ojibwa translation by Joan Commanda Tenasco) which is wonderful to see and something of which we need more. Unfortunately, since I do not know Ojibwa, I cannot attest to the merit of the translation, nor whether it makes any more sense in that language than in the English. But the English is confusing to say the least. Here is a short plot synopsis: Donovan's mom just went grocery shopping, but Donovan and his grandfather look in the fridge, and both agree that "there is nothing to eat". Donovan decides to go hunting for bear as his grandfather told him he used to eat bear for breakfast. Donaovan takes nothing but a rope with him, presumably to catch the bear (what he’ll do with it the bear is unclear). On his walk, Donovan's feet go "thump, thump, thump, thump, thump", and he yells out "bear, bear, bear, bear, bear!". A series of different creatures (an ant, a squirrel, a dog with a collar but seemingly no owner) follow him, yelling (with the exception of the dog) "kid, kid, kid kid kid!". When Donovan turns around to see what's following him, he yells at the creatures to go away, and they yell "aaaaaaahhhhhh!" in turn. The bear Donovan is searching for eventually finds him, chases him home, and Donovan's grandfather has to hit the bear on the head with a frying pan to get it out of the house. At the end, the family decides to have pizza for breakfast, since "pizza does not have big teeth" (no hint as to why Donovan's mom's offer of cereal was not sufficient). All said, this plot does not make much sense or have any kind of flow. We do not get an explanation as to why the animals can speak, why they follow the boy, why the boy is so upset about it, or why they scream when he tells them to go away. There is an especially strange illustration when Donovan yells at the dog which shows him stomping his foot with a big comic-book-like "zap" emitting from his shoe. The expression on his face makes him look afraid, and his arms are raised up as if in alarm. The poor dog runs away with his tongue hanging out. Throughout the book, text and illustrations do not always clearly represent each other, and this can be detrimental for emerging readers who are learning to interpret pictures in order to surmise what is happening in the story. The illustrations are also inconsistent. The boy's face changes quite a bit throughout the book, making him appear sometimes as a very short middle-aged man. The illustration on the cover shows a picture of a bear standing behind Donovan (presumably unbeknownst to the boy), with a fork and knife in its paws, licking its lips, and clearly excited to eat the waffles that Donovan is eager to dig into at the kitchen table. 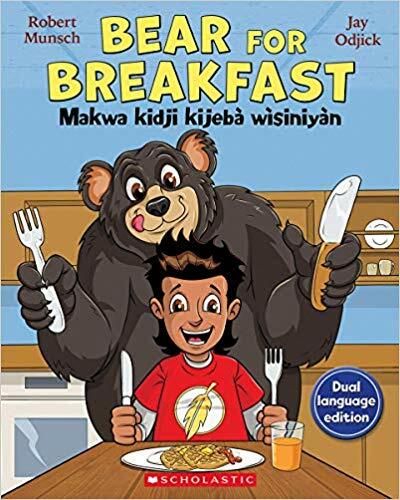 The reader may be led to believe that the bear will be a guest at the breakfast table in the story, not the meal intended, as the play-on-words might suggest. However, nowhere in the book are there either waffles or any mention of the play on words "for breakfast". Donovan wants to eat a bear. That's that. Okay. But why not hunt the bear? Why does the grandfather scare it off with a big bump on its head? Maybe there doesn't need to be a lesson here (something along the lines of "don't believe everything you hear" / grandpa was pulling your leg about eating bear), but it just doesn't work. The final page after the pizza breakfast is a completely unrelated vignette of the bear excitedly pouring honey all over a stack of pancakes. I cannot explain this. Merit can be found in the decision to pair Munsch's words to the illustrations of an Indigenous illustrator, Jay Odjick. Odjick's work can also be found in another Munsch classic - Blackflies. Who can forget the all-pervading “Nnnnnnnnneeeeeeeeeeeee” of both the mosquitos and the pesky titular insects? Odjick's swarms of flies were hilariously literal "clouds" of bugs, and children squirm with delight at the mere thought of being carried away by one of them. In Bear for Breakfast, there are little touches that are quite lovely: Donovan's mom's earrings are feathers, there is Indigenous art on the walls in their home, and Donovan is wearing a red t-shirt reminiscent of “The Flash” with a feather where the lightning bolt would be. The artwork was drawn digitally on a tablet monitor. The style is okay, but the perspective in some of the illustrations is slightly skewed. On the page with the ant, readers are looking at Donovan from the ant’s perspective, but it looks like the ant is the same size as Donovan’s shoe. Andrea Zorzi is a children's librarian at Toronto Public Library in Toronto, Ontario.